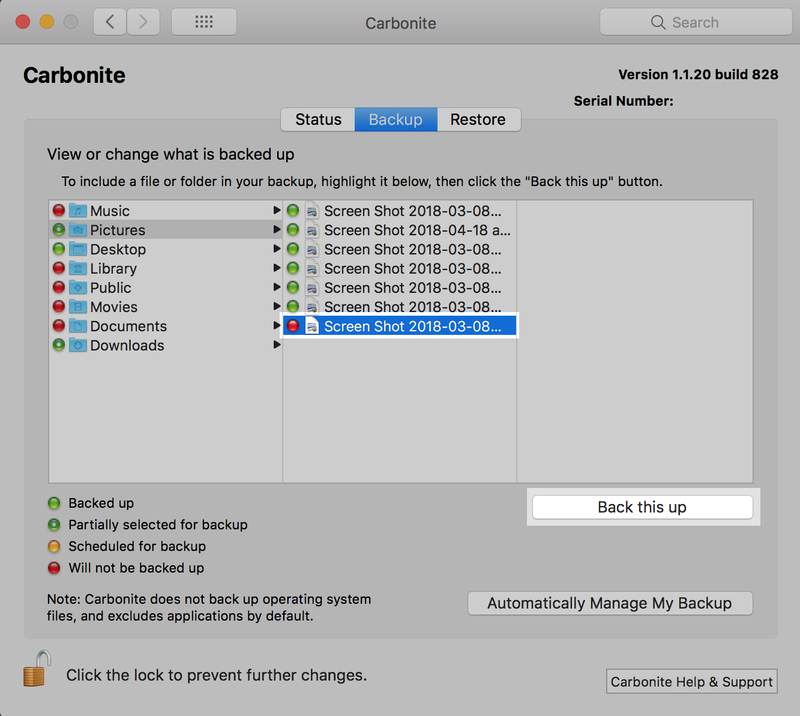 Carbonite Safe for Mac, allows you to add files to your backup from within the Carbonite interface. Please determine the Mac version before you follow the instructions below. If you have Carbonite version 1.x, files can be added to your backup from within the Carbonite Preference pane. 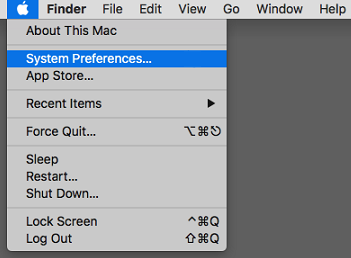 Click the Apple symbol in the menu bar and select System Preferences to open the System Preferences window. 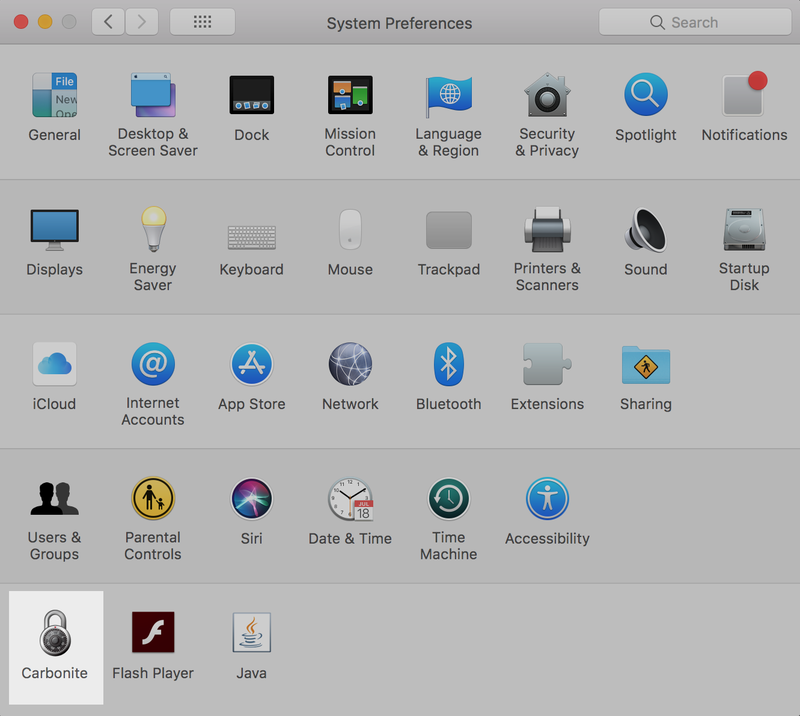 Within the System Preferences window, click on the Carbonite icon. The Carbonite Preference pane will be displayed. Click the Backup tab to manage your backup. Your computer's files and folders will be displayed with status dots placed on each of their icons to indicate their backup status. Files and folders with red status dots are not selected for back up. If your Backup tab doesn't look like the one in the screenshot below, click the Manually Manage My Backup button to view your backed up files. Navigate to a file or folder that you'd like to include in your backup by using the browse window within the Backup tab. Once located, select the desired file(s) and/or folder(s) and click the Back This Up button. The files/folders with red dots are the only ones that can be added to your backup. Files/folders with yellow and green dots are already included. If several large files are added to your backup at the same time, configuring your computer's hibernation and sleep settings so that it remains powered on and connected to the internet will ensure that your files are backed up as quickly as possible. 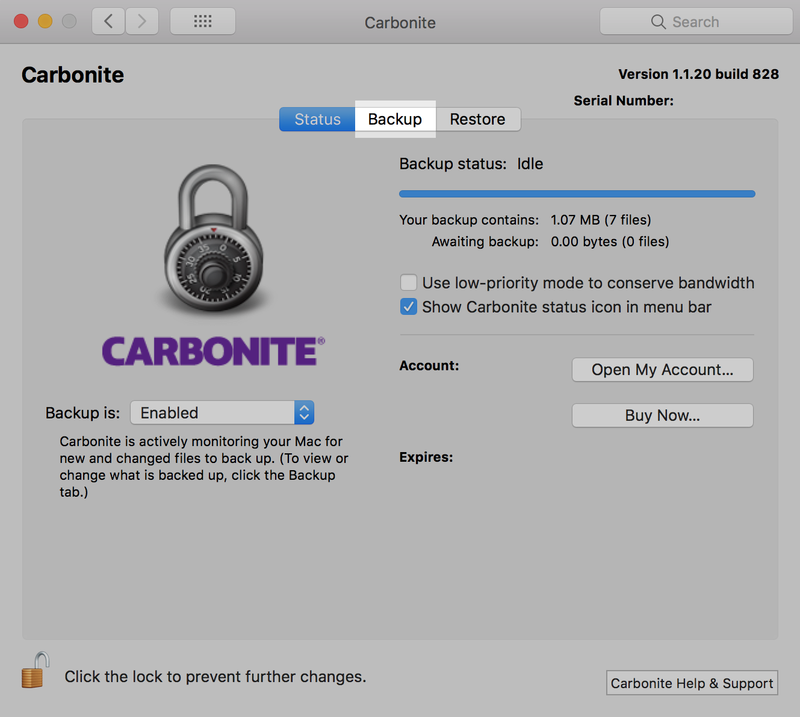 If you have Carbonite version 2.x, files can be added to your backup from within the Carbonite User Interface. 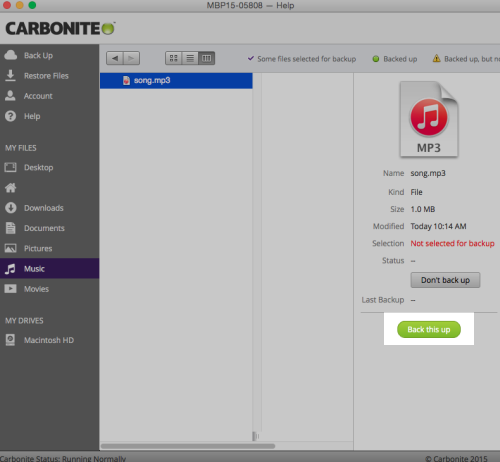 Click the Carbonite icon in the menu bar and select Open Carbonite to open the Carbonite User Interface. Within the Carbonite User Interface, click one of the tabs under MY FILES or MY DRIVES and navigate to a file or folder which is not selected for backup. Files and folders without status icons are not selected for backup. Locate the file or folder you wish to select for backup and click the Back this up button to select it for backup.